This technologically advanced home boasts a computer controlled system that regulates the home like a human body. Monitoring temperature, seasons and the time of day to maximize efficiency, this home is an energy over achiever- creating more energy than it uses. While this may sound futuristic, it’s happening right now, in a cold and cloudy Lystrup, Denmark in fact. Increasingly popular in the U.S., Passive Houses are energy efficient homes that mitigate power through the use of solar, wind or other renewable energy sources. 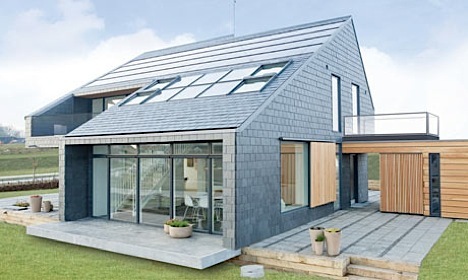 These homes are becoming the standard throughout most of Europe prompting a new frontier of energy Active Houses. These Active Houses are highly efficient homes that captures more energy than the occupants need for heat and power and require not only super efficient building techniques and materials, but also onsite renewable energy sources. For eight months a year, the solar cells produce excess energy to sell to the grid. In the winter months, the house buys back electricity – from renewable sources, of course. When a mass-market battery car finally reaches the market, there will be a charger for it in the garage and energy to spare. What may be most remarkable about this achievement is its location. Shrouded by clouds and overcast skies, it hardly seems, as The Guardian reporter points out “[the sun] barely seems strong enough to run a pocket calculator, let alone meet the energy needs of a family of four”. Covered in triple pane windows (equivalent to 40% of the floor surface area) every room seems bright, reducing the need for external lighting. The home utilizes effective insulation, plus a heat exchanger that warms fresh air on the way in during winter. Solar panels heat the home through under floor radiant heating and provide extra energy to feed to the grid. Just think if this house was in Arizona, you could probably power the whole block. With a very attainable energy consumption target of 4,000 KWh per year (when compared to the US Dept of Energy statistic of the average US household of 11,000 kWh per year), the future looks good for homes like these. Now if we could only get more home builders interested. [via jetson green > the guardian] Photo credit: Morten Fauerby for The Guardian. Since our country is facing economic crisis and climate change many people would want to use “green products” which will minimize energy use while caring for the environment. There are actually so many energy conservation products already available in the market. With solar control window film, you will find that people can reduce consumption without any visual effect on their windows for much less than other energy saving technologies. Window tint is a known and trusted “Green” technology, it is cost-effective, energy-efficient and above all, it is eco-friendly. Now that people is being aware of how Mother Earth is completely changing, we continuously innovates all of the things around us. In designing things we don’t just design it just for our own convenience but for helping the environment as well. As part of this, one of the discoveries that I think could make an impact are switch materials which can be commonly found in window and car glasses. This switch glasses (which they are commonly known) can easily change from clear to opaque glass with just a flick of a switch. To know more about this kind of materials, visit http://www.Tintbuyer.com. If you want to save earth, GO! Green!